Autodesk Alias software in action. Autodesk recently held an event at Aston Martin’s global headquarters in Gaydon, UK to demonstrate how Aston Martin brings together the physical and digital aspects of design – the Yin and Yang - to build its world-renowned luxury sports cars. 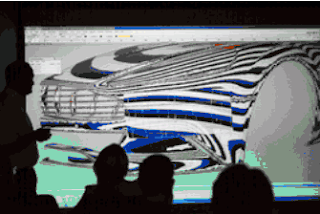 A mantra often heard within the Digital Group at the Aston Martin Design Studio is “from art to part with realism.” This phrase captures a very detailed design process but helps to explain how a design goes from inside the designer's head to being realistically visualized on the computer screen. That same design data is then used to prototype a part through the use of advanced rapid prototyping and 3D printing technologies, whether it's a small-scale part or a full-scale component such as an entire deck lid. From the first sketch at the start of the design process – produced digitally on a Wacom tablet or imported into Autodesk Alias – through to digital validation on the computer screen and then physical validation with a prototype part, all members of the team play a role in approving the design. This means that any issues can be spotted immediately, preventing costly changes further down the line in the tooling and manufacturing stages. An example of this is the design of a wheel. Previously, it would be sculpted by hand. This process could take up to six months before a one off wheel design was up to the standard where the geometry could be sent to the engineering department. Today, the designer only has to draw a segment of the wheel on a Wacom tablet and Alias will mimic that section all the way round the wheel. That data can then be used to produce a photorealistic visualization to share with others in the design team and can also be sent to the 3D printing machine to produce a prototype. This means that the design can literally go from 'art' one day to 'part' the very next.